Capecitabine (INN) is an orally-administered chemotherapeutic agent used in the treatment of numerous cancers. Capecitabine is a prodrug that is enzymatically converted to 5-fluorouracil (5-FU) in the body. It is often referred to as Xeloda, the name under which it is marketed by Genentech. It is available in 500-mg and 150-mg tablets. Sorivudine or its analogues, such as, brivudine. Allopurinol as it decreases the efficacy of 5-FU. Phenytoin, as it increases the plasma concentrations of phenytoin. Calcium folinate may enhance the therapeutic effects of capecitabine by means of synergising with its metabolite, 5-FU. It may also induce more severe diarrhoea by means of this synergy. The dihydropyrimidine dehydrogenase (DPD) enzyme is responsible for the detoxifying metabolism of fluoropyrimidines, a class of drugs that includes capecitabine, 5-fluorouracil and tegafur. Genetic variations within the DPD gene (DPYD) can lead to reduced or absent DPD activity, and individuals who are heterozygous or homozygous for these variations may have partial or complete DPD deficiency; an estimated 0.2% of individuals have complete DPD deficiency. Those with partial or complete DPD deficiency have a significantly increased risk of severe or even fatal drug toxicities when treated with fluoropyrimidines; examples of toxicities include myelosuppression, neurotoxicity and hand-foot syndrome. 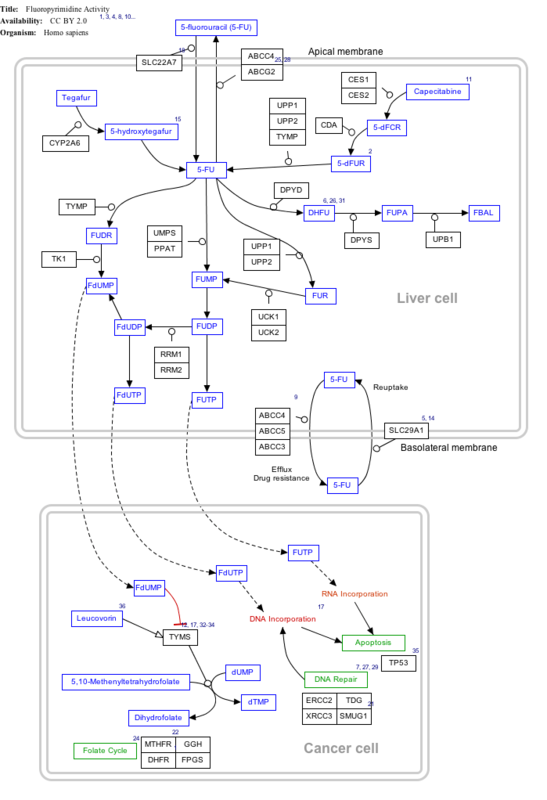 ↑ The interactive pathway map can be edited at WikiPathways: "FluoropyrimidineActivity_WP1601". Capecitabine is metabolised to 5-FU which in turn is a thymidylate synthase inhibitor, hence inhibiting the synthesis of thymidine monophosphate (ThMP), the active form of thymidine which is required for the de novo synthesis of DNA. 1 2 3 Rossi, S, ed. (2013). Australian Medicines Handbook (2013 ed.). Adelaide: The Australian Medicines Handbook Unit Trust. ISBN 978-0-9805790-9-3. 1 2 3 "Xeloda (capecitabine) dosing, indications, interactions, adverse effects, and more". Medscape Reference. WebMD. 25 January 2014. ↑ Joint Formulary Committee (2013). British National Formulary (BNF) (65 ed.). London, UK: Pharmaceutical Press. ISBN 978-0-85711-084-8. ↑ "XELODA (capecitabine) tablet, film coated [Genentech, Inc.]". DailyMed. Genentech, Inc. December 2013. Retrieved 25 January 2014. ↑ "Capecitabine Teva : EPAR - Product Information" (PDF). European Medicines Agency. Teva Pharma B.V. 10 January 2014. Retrieved 25 January 2014. 1 2 3 "Capecitabine 150mg - Summary of Product Characteristics (SPC)". electronic Medicines Compendium. Zentiva. 23 December 2013. Retrieved 25 January 2014. ↑ "NAME OF THE MEDICINE XELODA® Capecitabine" (PDF). TGA eBusiness Services. Roche Products Pty Limited. 5 December 2013. Retrieved 25 January 2014. 1 2 3 Caudle, KE; Thorn, CF; Klein, TE; Swen, JJ; McLeod, HL; Diasio, RB; Schwab, M (December 2013). "Clinical Pharmacogenetics Implementation Consortium guidelines for dihydropyrimidine dehydrogenase genotype and fluoropyrimidine dosing.". Clinical pharmacology and therapeutics. 94 (6): 640–5. doi:10.1038/clpt.2013.172. PMID 23988873. 1 2 Amstutz, U; Froehlich, TK; Largiadèr, CR (September 2011). "Dihydropyrimidine dehydrogenase gene as a major predictor of severe 5-fluorouracil toxicity.". Pharmacogenomics. 12 (9): 1321–36. doi:10.2217/pgs.11.72. PMID 21919607.